In stock 129 items in stock. 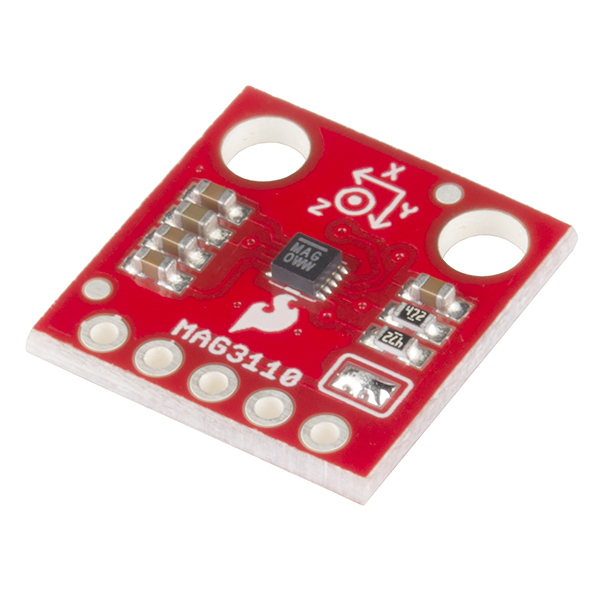 Freescale’s MAG3110 is a small, low-power, digital 3-axis magnetometer. The device can be used in conjunction with a 3-axis accelerometer to produce orientation independent accurate compass heading information. 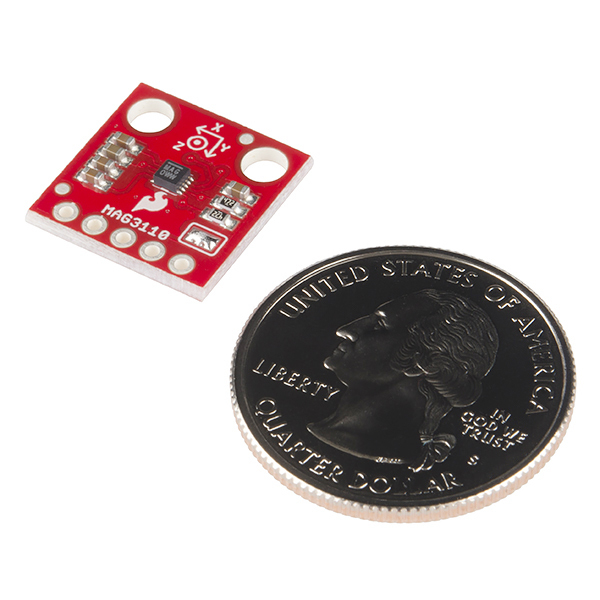 It features a standard I2C serial interface output and smart embedded functions. It's also a tiny QFN package which isn't very easy to play with so here is our easy to use breakout board. 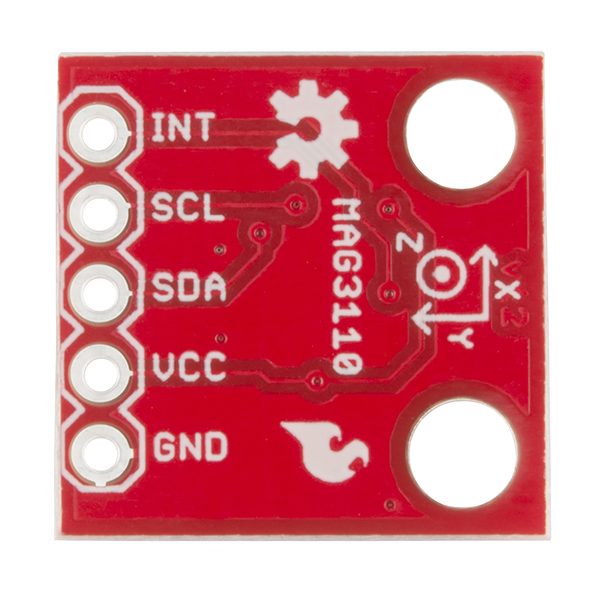 This board breaks out all of the pins for the MAG3110 to a standard 0.1" header and also supplies the necessary filtering capacitors so that you can easily use it in your next navigation project. Note: You will need to use a logic level converter if you are using an Arduino Uno or similar 5V logic device. Even if 3.3V is to be supplied to the VDD, an Uno putting out 5V logic can still fry this breakout. The sample code doesn't compile with the current Arduino environment. The calls to the Wire send method need to change to write and the receive method should be read. Or you can grab it from my gist. If you want to do a pull request on our GitHub repo, we'd gladly accept those updates! We prefer the pull request because it gives a history showing all the awesome contributors from the community. I'll gladly do a pull request, but as far as I can determine, there is no existing repo for the example code. Whoops! Looked at the wrong repo yesterday. The files are in there now - we keep all the code in the individual product's repository. Sorry about that! Hey guys, just a heads up that there is a error in the coordinate system marked on the breakout. On the top side, the z-axis points down. On the bottom silk screen, the z-axis is drawn correctly, but the arrow for x is mirrored from the correct orientation! Handy breakout, but this did cause some confusion when looking at the sign of some of the data. Thx! Is see that this is an update to the SEN-10619 MAG3110 breakout, which no longer is available. Aside from making the I2C pull-ups optional, the features of this version 12 breakout are the same as the prior version 11. So why did you change the pinout? Keeping the pinout the same would have let me use this version-12 breakout on my 35 circuit boards, which are designed for the version-11 pinout. Is there something particularly appealing about this magnetometer I am missing? It only have a FSR of 10 Gauss and is sensitive to 1 milligauss, which doesn't seem to be competitive with other current MR(I am guessing based on the need for a reset current) parts with similar power consumption. 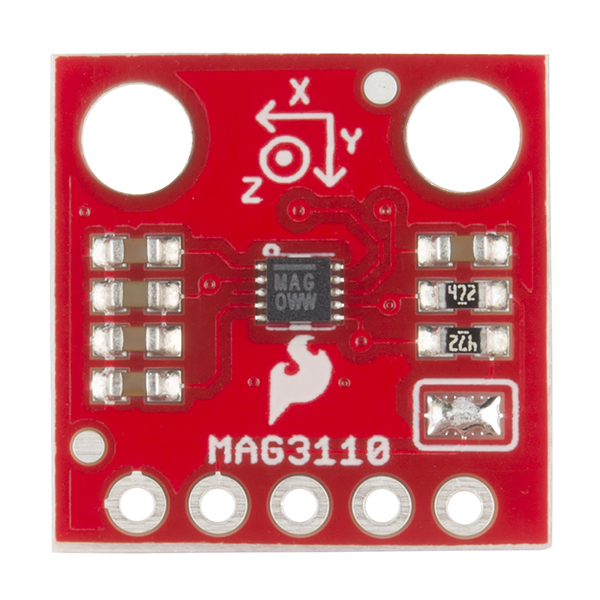 How about an inexpensive board with both the accerometer, and magnetometer? check out our IMUs, I believe we have a few 9DOFs (also have a gyroscope) on a single chip that are pretty cheap. Ordered this sensor since it fell between this or the HMC5883L, I had no immediate reason to pick one over the other so I just went with this one. After receiving it and working it into my autonomous vehicle project, I found it very difficult to get running. First I had little experience with I2C so it was difficult to get the data off. Once that hurdle was passed I thought it would be smooth sailing, boy could I have not been more wrong. At no point could I find any information on how to calibrate the compass or how to convert the raw data to something usable. There is virtually no information surrounding this chip that isn't horrifically out dated to the point that it isn't even worth looking at. Also, it seemed I was not the only person who issues like this. It's perfectly good and does what it says, but it would be even better with a logic level converter.